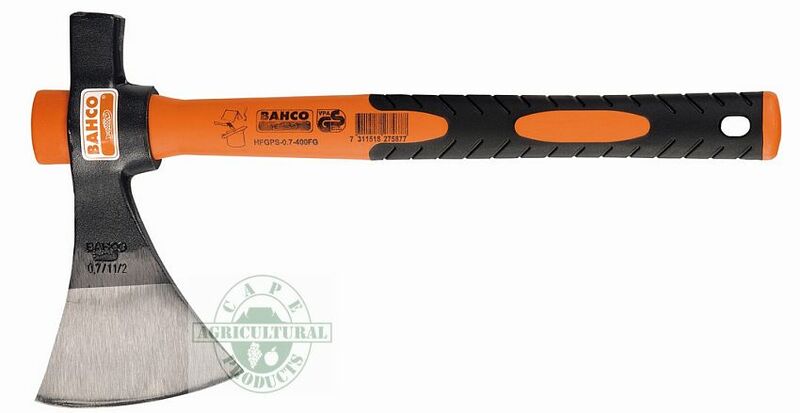 Bahco axes are manufactured in Germany and Italy from high quality carbon steel, hardened and tempered for superior durability. In line with Cape Agricultural Products desire to stock only products of high quality, we recommend these axes, and have chosen models from the range that should satisfy your needs. All wooden handles are secured with a jagged carbon wedge and axes heads over 1kg are secured with an additional metal ring wedge. The handles are made of high quality Ashwood or USA Hickory for durability. Spare handles are available and these are supplied with a fixing wedge as well as an instruction card. 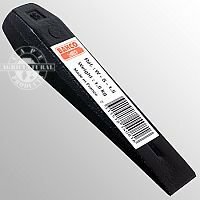 On this page you will find a selection of Bahco axes, together with pointers on axes safety and care to ensure your experience of using these high quality tools is pleasant and safe. 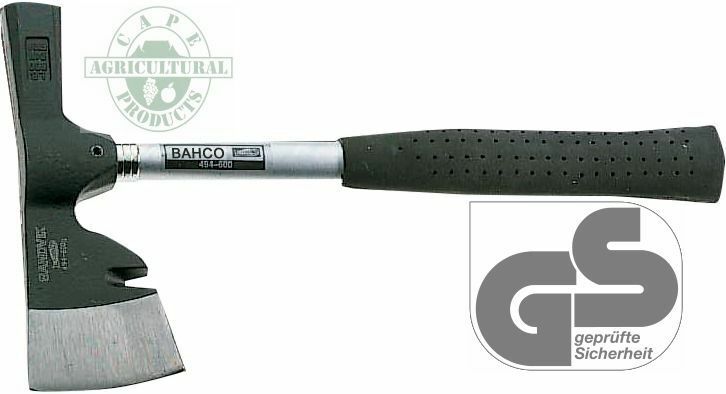 An excellent Bahco product for splitting wood. Are you tired of trying to split wood with an axe that has been designed for felling trees, or for general purpose work? The LS-Merlin splitting axe is our best selling axe and is the solution to your splitting problems. It is flat on one side for use as a hammer/maul to drive a wedge, and the special wedge-shaped head, together with it's weight, makes it easier to penetrate and split wood. The 3 component handle - Polypropylene handle with fibre glass core and elastomer grip - ensures comfort, safety and long life. A comfortable non-slip grip on the fibre glass handle offers a soft and secure grip and the large suspension hole makes the axe easy to hang when not in use. If you need a very heavy splitting axe, then the MES-3.5 is the one for you, with a head that weighs 3.5Kg! LS-MERLIN-2.5FG - Head : 2,5Kg. Length : 900mm. Total weight : 3,3Kg. MES-3.5-900FG - Head : 3,5Kg. Length : 900mm. Total weight : 4,3Kg. Another excellent axe that has been designed specifically for splitting wood. The special wedge shaped head, as well as it's weight, provide easier penetration when forcing wood apart. The head of the axe weighs 2Kg and the length of the axe is 800mm. Quality ashwood handle secured with a carbon wedge and metal ring wedge. SUS-2.0-800 - Head : 2Kg. Length : 800mm. Total weight : 2,4Kg. DO NOT stand erect when you split wood. It could result in severe injury if you miss your target. Bend your knees slightly to make sure the axe hits the ground if you should accidentally slip. DO NOT try to force splitting wedges into the wood with a normal axe. This could deform the eye and cause a loose handle or broken head. You should use a maul or sledgehammer, which are both designed for use with splitting wedges. DO NOT twist the axe from side to side if it gets stuck, as this could break or loosen the handle. Instead, work the axe loose by using an up/down lever motion. 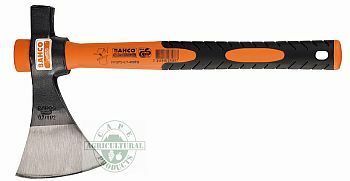 Bahco hatchets are lightweight axes with a short handle which makes them easy to carry around and they can even be used indoors. The hatchets are ideally suited to situations where alien vegetation has to be cleared, due to it's light weight. It is also ideal for chopping/splitting wood for your braai [BBQ] or fireplace. The head is fixed to the handle with a plastic wedge. Head weights range from 600g to 1Kg and the ashwood handle lengths range from 360mm to 400mm. HGPS-0.6-360 - Head : 600g. Length : 360mm. Total weight : 785g. HGPS-0.8-380 - Head : 800g. Length : 380mm. Total weight : 1Kg. HGPS-1.0-400 - Head : 1,0Kg. Length : 400mm. Total weight : 1,285Kg. Felling Axes are heavier axes with longer handles and a thin edge, to cut easily into the wood when felling trees. These axes have head weights that range between 1Kg and 1,8Kg and the curved ashwood handles range from 600 - 800mm in length. Handles are secured to the head with a carbon fibre wedge as well as a metal ring wedge, and are replaceable. FGS-1.6-810 - Head : 1,6Kg. Length : 800mm. Total weight : 2,275Kg. FGS-1.8-810 - Head : 1,8Kg. Length : 800mm. Total weight : 2,4Kg. The axe below is a flare-headed felling axe with a long, straight handle enabling a long swing and deep cut. A large hole at the end of the handle makes the axe easy to hang when not in use. FFSS-1.5-900FG - Head : 1,5Kg. Length : 900mm. Total weight : 2,4Kg. DO NOT use the axe on the side of the trunk where you are standing as it is easy to slip and hurt yourself. Make sure the trunk is between you and the branches you intend to remove. The easiest way to cut branches is to cut from the root towards the top. This is a general purpose axe for lighter applications, with the reverse side of the head suitable for use as a hammer. It is ideal for 4 x 4 enthusiasts, camping trips and general light-duty use around the house. The straight, three component handle with non-slip grip is a new modification to this model. 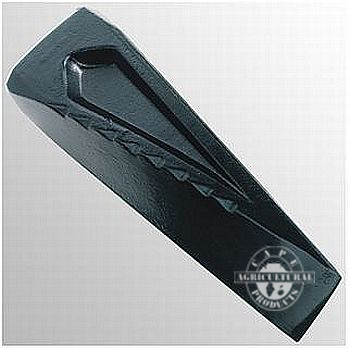 The handle is polypropylene with an elastomer grip and fibreglass core. This new handle design gives comfort, safety and long life. HFGPS-0.7-400FG - Head : 700g. Length : 430mm. Total weight : 950g. Also known as a plasterer's hatchet this small hatchet is ideal for camping trips and light duty work when making a fire. Ideal item to keep in your outdoor kit or 4x4 vehicle. The tubular steel shaft, has a comfortable rubber handle. It has an anti-slip striking face and a nail puller incorporated into the blade. GS certification mark means the tool meets German technical safety requirements. 494-600 - Head : 400g. Length : 315mm. Total weight : 845g. DO NOT store wooden handled axes in a dry place. Under very dry conditions the handle could shrink and may no longer fit perfectly into the eye. Outside storage [or the garage] is recommended. Splitting Wedges, when used together with a maul or sledge hammer are used for splitting very hard and thick wood. As described above, DO NOT try to hit the wedge in with the back of a normal axe as this will damage the axe. The traditional steel wedge [see left], can be used. Also available is a twisted steel wedge of 2Kg which is for easy splitting of hard-to-work types of wood, needing little force to drive it in.